The needs of your precious pets are a huge factor when you decide to move from your old home to a new one. This is especially true when you have a dog in your family. Dogs require room to run and play. They require daily walks and socialization. Choosing the perfect home for all of your family--including your canine--is crucial if you want to ensure a safe and happy environment for your dog. Here are some tips to consider when you're on the hunt for a new home, and you have to consider Fido's needs too! One of the first things you should think about is the kind of home you need and how that will affect your dog. Do you want a two-story home? This may be a great option for a young dog. After all, young dogs won't even blink an eye when they are asked to climb a winding staircase. But if your canine companion is getting on in years, you may wish to stick with a one-story home. Older dogs often suffer from joint problems or heart conditions. You don't want them to go up and down steps all of the time if they aren't in the best of health. Do you have a Doberman or a Yorkie? If you have a dog that rivals the size of a pony, you probably don't want to purchase a small condo or bungalow. Big dogs need plenty of room to stretch out and play. Smaller dogs will feel just fine living in a cozy little home. You want your dog to be comfortable, so be conscious of the home size and the size of your pooch before you purchase your new digs. Some condos, townhomes or patio homes may have breed restrictions. In other words, they may not allow certain dogs that have an aggressive reputation. Even if your large pit bull is the sweetest of sweethearts, check out any breed restrictions before deciding on a home. You don't want to find out that your type of dog isn't permitted after you've already signed on the dotted line. Yes, that two-story home with the granite countertops and the hardwood floors is your dream home. But is it located on a busy street? Houses located on streets with large amounts of traffic may not be the best choice for a dog owner. No matter how much we try to protect them, dogs will sometimes escape from the house or yard. You don't want your dog to race into the street and get hit by a car. Find a neighborhood where traffic is light. It will provide you peace of mind and help your dog stay safe. Before the big moving day, try to take your dog to visit the new neighborhood. Stroll down the street so your dog will be familiar with the new scents and sounds. Allowing your dog to get a preview of the foreign environment where he or she will be living can make your dog feel more at ease. He or she has the chance to encounter the other dogs in the neighborhood and will feel less threatened by the canine neighbors. Dogs are territorial animals. So before your dog enters the new house, take a towel from the old house and rub it along the walls and furniture--at the exact height of your pooch. Having the familiar scent of the old home in the new house will make your dog feel more comfortable with the transition. 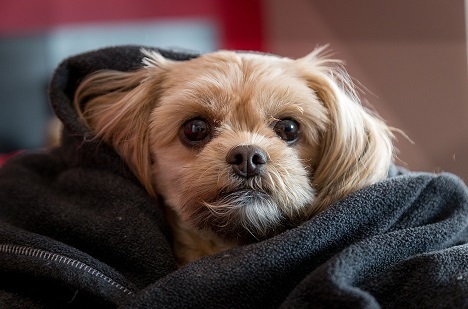 Make sure your dog has his or her flavorite blanket and toys before entering the home. Show your pooch the location of the dog bed as well as the water and food bowls. Moving is stressful for humans, but dogs are stressed out by moving too. Don't let that keep you from buying your dream home. If you take the time to select the right home for your pooch and help your dog acclimate to the new surroundings, you will be successful in getting him or her settled into your new digs.